This lovely community, replete with its many canals and waterways is in southeast Naples, about halfway to Marco Island at the intersection of Collier Boulevard and Sabal Palm Road. The immediate area to the west and south is undeveloped preserve. Collier Boulevard provides direct access to Marco Island, just a nine-mile drive south. With most homes built on one of the approximately 30 peninsulas, more than 90% of Verona Walk residents have unrestricted water views. Lighted walking paths allow residents to stroll from one neighborhood to another across traditional Venetian style pedestrian bridges. Individual neighborhoods consist of single-family homes, attached villas, or two-story townhouses. Single-family homes are available in 17 different models and with floor plans that range from 1,392 to 2,611 square feet. Homes are available in two, three, and four bedroom styles, including two-car garages. The attached villas also feature attached, two-car garages and range in size from 1,526 to 1,858 square feet under air. Verona Walk Condos also feature two-car garages to the rear of each lot, providing much more curb appeal for the front of the buildings. 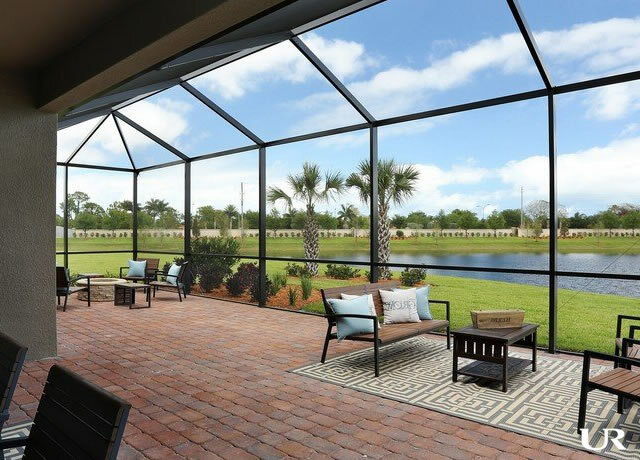 Every Southwest Florida community offers the usual amenities, but Verona Walk has added features that are truly unique. Sometimes the difference is in the adjectives that make each amenity unique. For instance, when you add “fully-lit” and “full-size” before “basketball court,” it makes a difference. When “145 feet long” and “heated” precede “resort-style pool,” it makes a difference. Those facilities are located at the Verona Walk Town Center, which, as its name implies, is at the center of the community. The Town Center is the epicenter of the social life and activities for Verona Walk Residents. In addition to the expected, restaurant, social rooms, and fitness center, it also features a library, a post office, a bank, a travel agent, a beauty salon, a massage parlor and chiropractor, a gas station, and a car wash. A full-time activities director organizes social functions including bingo, card games, classes for all age ranges and movies. The Café Verona offers a variety of lunch and dinner fare at reasonable prices. In addition to the pool and basketball court, the Town Center is surrounded by outdoor amenities that include a lakeside gazebo, three Bocce courts, and a heated lap pool. Two of the eight lighted, clay tennis courts have grandstand seating from which fans may cheer on their favorites in community tournaments. There is even a Tot Lot playground area for the young children. Verona Walk is secluded, but not isolated. Our famous beaches are less than 20 minutes away. A hospital, an urgent care clinic, and Lely Elementary School are just a mile away. Publix is a mile-and-a-half north of Verona Walk’s gates. Verona Walk is just five miles from I-75, so getting to Ft. Myers’ Southwest International Airport, Sanibel Island, Ft. Lauderdale, and Miami is easy. Verona Walk is an ideal community in an ideal location, comfortable, affordable and convenient.